(L-to-R) AASA Executive Director Dan Domenech, Principal Louis Rojas and AASA President Alton Frailey. 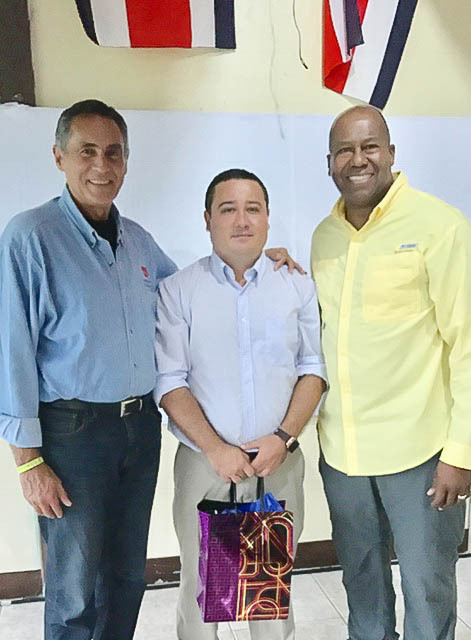 Costa Rica – Louis Rojas is the principal of the San Rafael School, a small facility serving 114 students. Louis reports directly to a district supervisor that is similar to the district superintendent in the U.S. Similar to the other schools we have visited, San Rafael educates preschoolers ages 4-5, kindergarten for 6-year-olds and the primary education grades 1-6. From there, students will attend “college,” the equivalent of high school for our students. Uniforms are required in all schools as to eliminate economic differences. Their “college” is a six-year program where the first three years focus on general education while the last three require students to focus on either academic or technical tracks. They will graduate with a “bachelor’s” degree that grants them access to the public and private universities in the country. Similar to the U.S., poverty is also a major factor. Forty-two percent of preschool children live in homes where parents have less than six years of schooling and more than 60 percent live in poverty. All of the schools we visited were lacking the resources that the principals regarded as necessary to meet the needs of the students. Nevertheless, there is an overwhelming commitment to educate all children supported by administrators and teachers who do the best they can with what they have. This entry was posted in Education and tagged AASA Executive Director Dan Domenech, AASA in Costa Rica, AASA International Seminar Delegation, AASA International Seminar in Costa Rica, Dan Domenech, Dan Domenech Blog, Education in Costa Rica by Dan Domenech. Bookmark the permalink.